Designing the nursery is a very exciting time, especially if you’re a first-time parent. We all want to create a safe, loving, and beautiful environment for our child, but between choosing themes, deciding on colors, and selecting furniture, it can grow to become an overwhelming process. Today, we’ve decided to share our top nursery ideas to get your space ready for your new bundle of joy. Our own Kathy Kuo is a mother of two, so we’ve gone through the process many times here at Kathy Kuo Home. 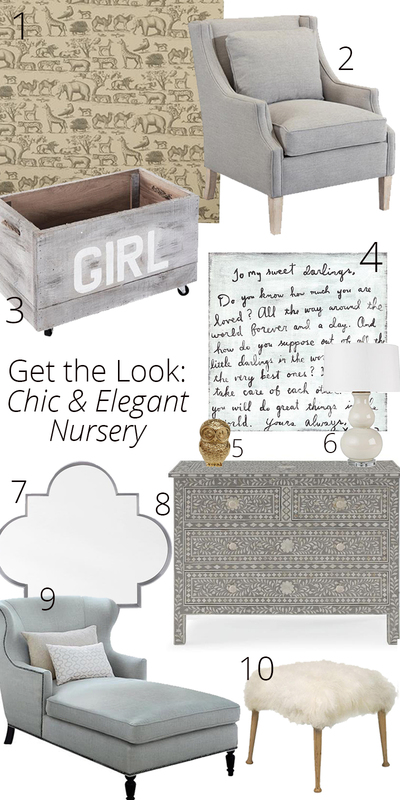 Read more about some of our favorite nursery looks (including our own) below. Think outside of “blue is for boys, pink is for girls.” Our favorite nursery color choice recently is a soft, modern grey. Grey is timeless and a classic color that looks soft and inviting for all genders. It also works well with any accent color you pick, and it creates a nursery environment that’s peaceful and relaxing while still looking elevated and luxurious. Regardless of what color you choose to paint the nursery, it’s very important to insert bold colors and pattern into the room. In fact, studies show that pastels (while pretty) are not very engaging for the baby. Use contrasting colors like black and white stripes or bold graphic patterns in a strong color to encourage visual development. Not only is it good for the baby, but it looks great! 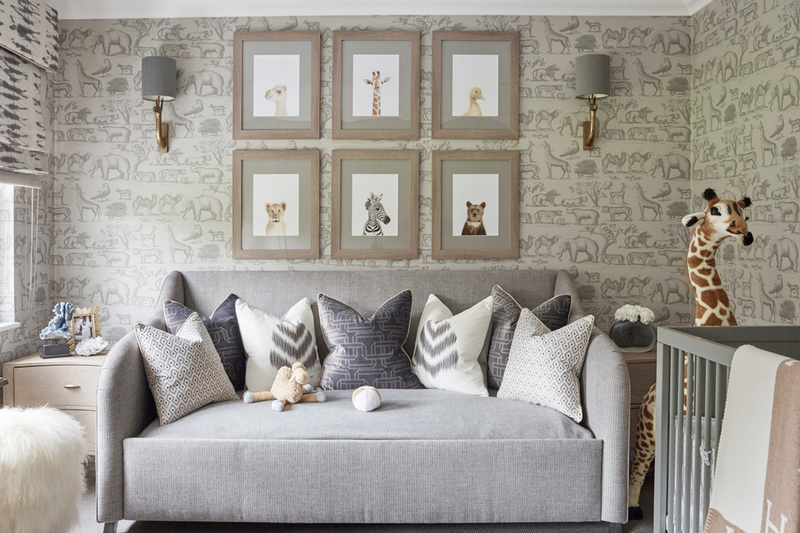 Some of our favorite places to incorporate pattern are the walls or upholstery. We’ve written about wallpapering ceilings, and this design tip is another thought to keep in mind for nurseries. Think about how much time babies are on their backs looking up! A nursery requires several different moods. You want a space that’s light and bright in the mornings for when you’re getting them dressed and changing diapers, but you also want soft and dim lighting for when you’re rocking the baby to sleep and need a soothing atmosphere for bedtime. This is also great for when the baby wakes up in the middle of the night (you know how many times that is going to happen! ), but you don’t want to startle the baby with bright lights that’ll make it difficult to get them back down. Adding a dimmer is a quick and efficient solve for all of these common problems at a minimal cost. Choose furniture that can be used beyond the baby’s first year. Nowadays you can buy cribs that can convert into a kids bed. Instead of a changing table, opt for a beautiful dresser they can use when they grow up, and use a detachable dressing table top for their early years. And don’t forget to keep plenty of open floor space (with a very soft rug) and add some fun elements (such as a rocking horse) for when the baby grows into a toddler. This is probably one of the most common nursery mistakes we see. As parents, we are so concerned about getting everything right for the baby that we forget to incorporate furniture for ourselves! Make sure to include comfortable seating like a sofa or daybed in addition to a chair or rocker that makes it easy for feeding the baby and encourage mom and dad to take a nap sometimes too!